Although one of the most prominent goals of our research project is to demonstrate the lasting relevance of periodicals like the Lady’s Magazine, the very ‘periodicity’ of the genre obviously required that the magazine also directly appealed to the concerns and interests of its readership at the time of each issue’s appearance. This creates the need for reference to topical events, and for the inclusion of seasonal items on important dates that are marked annually on the calendar. The most commercially successful publications have always been those that found ways in which to insinuate themselves into the day-to-day routines of their readers, anticipating what they will be thinking of when the magazine appears, and ideally even associating themselves in the reader’s mind with popular holidays or other collectively experienced recurrent events. The Lady’s Magazine would for instance dutifully print the productions of the poet laureate on the birthday of the monarch, but a more extensively covered, and maybe more appealing subject, was Christmas. LM, VI (1775). Image © Adam Matthew Digital / British Library. Not to be reproduced without permission. It is common knowledge that Christmas has not been celebrated in Britain in the same way throughout history, and that, besides worldly fashions, often tumultuous changes in religious regulations (and sometimes legislations) have played their role. Christmas as we know it today was after all only firmly established over the course of the nineteenth century. Nevertheless, the official commemoration of the day that, in the words of pseudonymous poet ‘Christiania’ (1775), ‘sacred deity from heaven came’, could never go by unnoticed. With its wide readership that furthermore diligently helped to furnish content, the Lady’s Magazine is a useful source on the celebration of this holiday from the late eighteenth to the early nineteenth century. Most of the numerous and diverse Christmas-themed contributions to the magazine can be found in the annual ‘supplement’, a thirteenth issue that unlike the famous ‘Christmas numbers’ of the Victorian age shows little thematic coherence, and appears to be mainly intended to cash in on the fact that at this time of the year the public would be in a spending mood. Besides religious poetry there is also more worldly verse, as when in 1789 an anonymous poet looks back fondly ‘on five ladies who composed verses for their amusement at Christmas’. 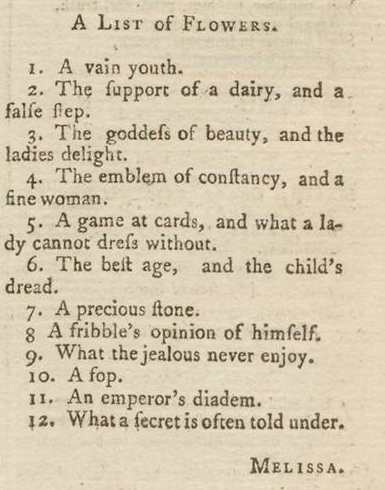 With a hyperbole characteristic of much of the Lady’s Magazine amateur poems, these “five graces” are said to be so talented at “verse divine” that the god Apollo decides to claim them for his new Muses. In her advice column, the magazine’s agony aunt and conduct guru ‘the Matron’ annually discusses her plans for the holidays, which she usually spends with her son, a country squire who provides his servants with well-supervised Christmas entertainment. Various essays that compare contemporaneous to historical customs are featured, such as on ‘Christmas sports’ (1796), and in 1780 the anonymous author of ‘Thoughts on Christmas-tide’ delivers an account of the festival across the different social strata that should be of interest to cultural historians. LM, XI (1780). Image © Adam Matthew Digital / British Library. Not to be reproduced without permission. According to the author, this ‘pocket-money’ is spent on playing ‘the fine gentlemen of the week’, or as long as these limited funds may last. ‘A merry Christmas has ruined many a promising young fellow, who has been flush of money at the beginning of the week, but before the end of it has committed a robbery on the till for more’. For ‘persons of fashion’, this ‘annual carnival’ is of course most horrible: ‘boisterous merriment, and aukward affectation of politeness among the vulgar, interrupts the course of their refined pleasures, and drives them out of town.’ As the author (ironically?) concludes, ‘[t]hese unhappy sufferers are really to be pitied’. Locating within the Lady’s Magazine material on Christmas, or any other topic, will become very easy in early 2015, when we launch our annotated index. In the meantime the team wishes you a merry Christmas and a happy New Year. This entry was posted in Content on December 22, 2014 by knlc. Magazines have not, as a rule, fared well in literary history. Condemned by the very topicality that once made them so popular, periodicals are often cast as the mere ephemera in the face of which works of true literary merit have endured. The bad press that magazines have received is not unwarranted. The eighteenth-century periodical marketplace could be as cut-throat and unprofessional as it was lively, with some titles barely lasting for a handful of issues. Even those serial publications that enjoyed much longer print runs bear material witness to their contingent status. Few survive intact. Readers routinely removed plates and engravings. They frequently ripped out embroidery patterns or song sheets and wrote copiously in the margins or scribbled all over their pages. LM, XXXII (1801). Image © Adam Matthew Digital / Britishl Library. Not to be reproduced without permission. Yet, the blanket association of the genre with ephemera is profoundly misleading. Titles such as The Lady’s Magazine didn’t only survive by being lucky. Monthly issues were printed with an expectation that subscribers would bind them according to the publisher’s printed instructions and preserve them in bound volume form for posterity. References were made to articles in earlier volumes in expectation that readers would still have them to hand. And there is anecdotal evidence that some magazine readers went to great lengths to preserve their libraries against the ravages of the elements and time, such as the brine soaked, shipwrecked and salvaged copies of The Lady’s Magazine that Charlotte Bronte recalled reading as a child when she should have been paying attention to her lessons and which had once belonged to her mother or aunt (Letter to Hartley Coleridge 10 December 1840). But the Lady’s Magazine was about preservation in other ways, too. From its opening issue in August 1770, the editors proclaimed that ‘Every branch of literature’ would ‘be ransacked to please and instruct’ (LM 1 (August 1770): 1). No generic stone would be left unturned in their pursuit to cultivate the female mind; nor would the work of any living or dead writer (man or woman) whose literary efforts conduced to female improvement. Although a good deal of the content of the magazine was apparently original, much besides was repurposed from extant sources. Indeed, one of the many strands of our research project is divining the shifting ratio of old to new content over the course of the magazine’s run. I must confess, however, that when I first began reading the Lady’s Magazine more than fifteen years ago, I tended to skip those poems and extracts from those books on travel, history, religion and conduct I could read elsewhere. I noted with little more than passing interest that the magazine was fairly even handed in its inclusion of nuggets of wisdom from uncomfortable bedfellows such as James Fordyce, Dr Gregory and Mary Wollstonecraft. The more I read the magazine, however, the more I became interested in what works and which authors the magazine chose to acknowledge and how. Why reprint that particular letter of Lady Mary Wortley Montagu’s (on hair dye) in August 1771 (II: 68) and not another? 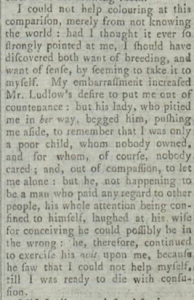 Why those particular extracts (‘On Modesty’ and ‘The Character of the Notable Woman and Fine Lady Contrasted’) from A Vindication of Woman in the June 1792 issue of the magazine? These are not always easy questions to answer. Neither are the effects of these selections – whether made by editors or by enthusiastic readers who transcribed passages of their own choosing – always easy to fathom. But two things are clear: such choices matter; and sometimes they surprise. LM, XII (1781): 135. Image © Adam Matthew Digital / Birmingham Central Library. Not to be reproduced without permission. 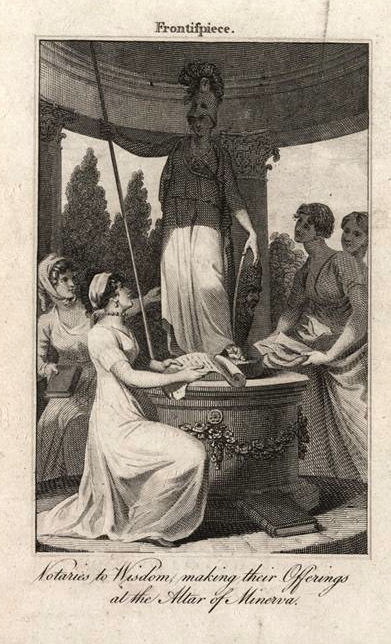 No one would be shocked to find Montagu or Wollstonecraft occupying page space in the 1770s and 1790s of the magazine, or by the numerous laudatory references to the Bluestockings throughout the first decades of the title’s run. 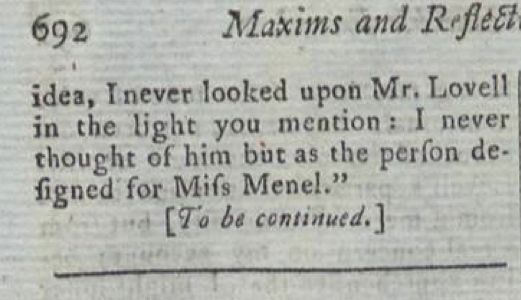 Some might be slightly taken off guard, however, by the extracts from The New Atalantis (1709) that appeared in the March 1781 issue under the title ‘Observations by the celebrated Mrs. Manley’ just four years before another (albeit reluctant) Lady’s Magazine contributor, Clara Reeve, remarked that Manley’s works were best forgotten in The Progress of Romance. 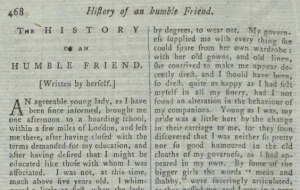 Few readers could similarly have expected that the poet Elizabeth Thomas, known popularly in literary history as ‘Curl’s Corinna’ thanks to Alexander Pope, would form the second subject of the magazine’s ‘Lady’s Biography. Modern’ series in May 1771. One of the many important aspects of the Lady’s Magazine that our project index will help to shed light on is who the magazine was keen to preserve for literary posterity and who it was not in the form of its long-running biographical series of illustrious literary women and selections from the works of noted writers. Such data has the potential both to underscore and (perhaps more importantly) to disrupt some of our entrenched assumptions about the making of literary history in the second half of the long eighteenth century. 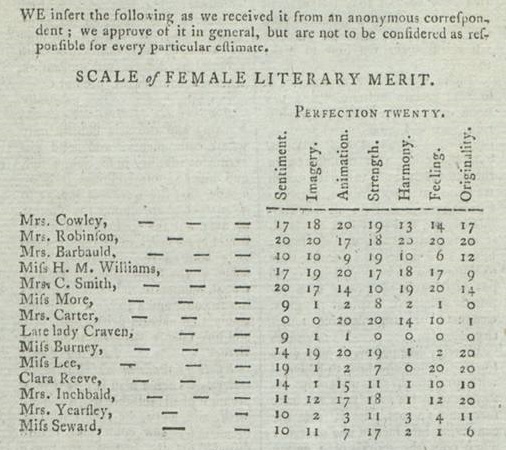 This was a project that, as we know, had serious repercussions for the status of women writers and women’s writing, even if the magazine itself could sometimes be rather less than serious about the important work of preservation and the rather specious criteria upon which such acts of literary judgement were made. 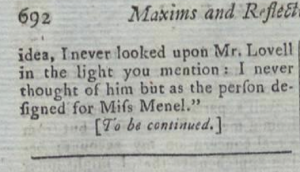 LM, XIII (June 1792). Image © Adam Matthew Digital / Birmingham Central Library. Not to be reproduced without permission. This entry was posted in Uncategorized on December 15, 2014 by ladys-magazine. Periodical publications, and especially the subgenre of the magazine, are seldom a one-way street. The content they provide readers with may stimulate response in the form of letters to the editor and other unsolicited copy, and many periodicals turn this reciprocity to good use. 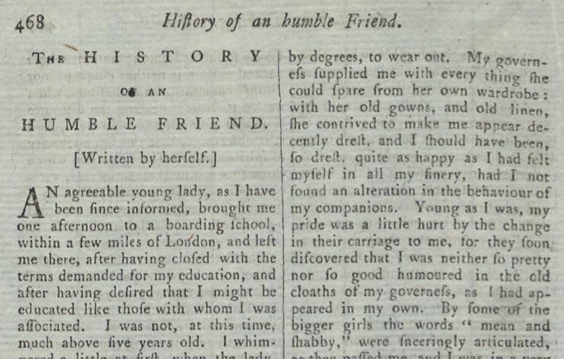 As previous blog posts have shown, the Lady’s Magazine was particularly welcoming to the writings of its readership, developing it into a community of reader-contributors who used the magazine as a platform to express their thoughts and feelings, and sometimes to engage with each other. They did this in opinion pieces, (overly) serious poetry, prose fiction and philosophical essays, but there was also room for more light-hearted contributions. There are for instance entertaining puzzles in almost every issue. These come in several closely related forms, such as “charades”, being playful descriptions of a person or object (often in verse); “enigmatical lists” that provide clues to a number of hidden concepts from within an indicated category; and traditional word riddles like anagrams and rebuses. 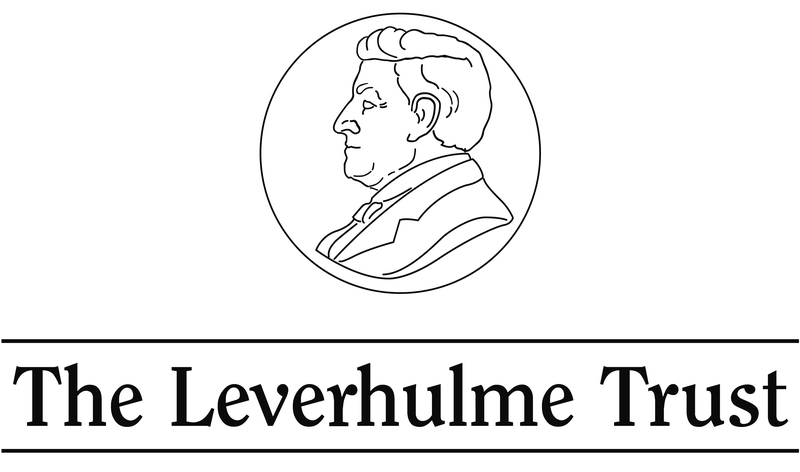 All were meant as a challenge to other readers, who would submit their solutions to be printed in the following number. LM, VI (1775). Image © Adam Matthew Digial / Birmingham Central Library. Not to be reproduced without permission. 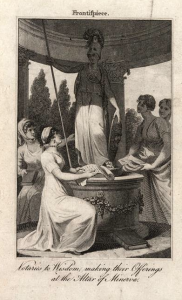 The popularity of the Lady’s Magazine made it a frequent reference in secondary sources, and we can gain insight into how readers enjoyed their puzzles from such contemporaneous accounts. 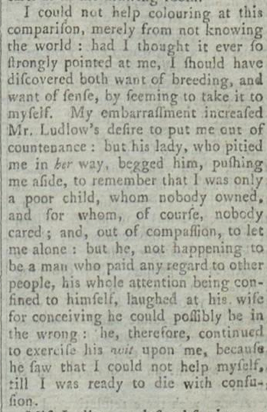 Henry Mackenzie’s essay periodical the Lounger features a seriocomic account of a clergyman who complains that “a young lady […] tried [him] with the enigmas of the Lady’s Magazine, and declared [him] impracticably dull”. Another reverend personage, in the similar publication the Looker-on, objects to “persons, who are called ingenious gentlemen, who have in general no other claim to this title than what is derived from the solution of an enigma in the Lady’s Magazine”. That both puzzles and solutions were regularly published with signature already implies that, even with these less consequential items, there was a sense of achievement if one’s ruminations made it into print. This is not surprising, as devising and solving such riddles allowed for the demonstration of the contributor’s quick intelligence and sense of humour, united in the then highy valued qualification for social life, “wit”. The solutions often contain comments on the originality or intricacy of the puzzle replied to, and certain contributors appear to develop a fondness for each other, repeatedly responding cordially to one another’s submissions. LM, XXI (1790). Image © Adam Matthew Digital / Birmingham Central Library. Not to be reproduced without permission. The puzzles are often still amusing today, and give us an idea of the kind of entertainment that the public sought to derive from print media. Because biographical information on reader-contributors is very scarce, they are furthermore useful for finding out more about the demographics of the magazine’s readership. Not only do readers who seem to know each other outside the magazine sometimes divulge information about their correspondents, but the often highly specific topics of the riddles can also suggest research leads. For instance, the but limited local interest of the “Enigmatical list of Young Ladies of Aldborough in Yorkshire” (August 1784) may help to identify its otherwise mysterious contributor signed “G. Dixon”. When the unknown quantity “R. Beaumont” replies to the long “Enigmatical list of Aldermen in the City of London”, submitted by one “J. Randolph” (March/April 1790), this would suggest some acquaintance with (or at least interest in) metropolitan local government for both correspondents. As contributors in this section often contribute material in other genres too, the puzzles can be very helpful when attributing pseudonymous contributions throughout the magazine. Regrettably, the gallantry of the gentlemen contributors to the Lady’s Magazine was sometimes compromised when a topic for an enigma presented itself. 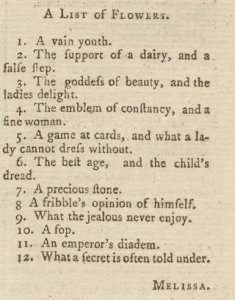 In December 1788, an anonymous lady wrote in to complain that she had found in a previous issue a puzzle that listed “Old Maids in Newark”, and her name, she believed through error, “inserted in the list of that venerable tribe”. She got her revenge by instantly submitting a list of no less than thirty bachelors in her Nottinghamshire home. From then onwards, editorial statements in the front matter regularly advised contributors that similar “lists of old maids” would no longer be printed: “We affront no species of females”. If you wish to find out whether you would have fared better than the rustic reverend, we recommend that you follow the Lady’s Magazine research project on Twitter, @ladysmagproject. Choice examples of puzzles, and their solutions, are regularly posted there. This entry was posted in Index on December 1, 2014 by knlc.